One morning, the mother pig said, "You must go into the world and make your own way." 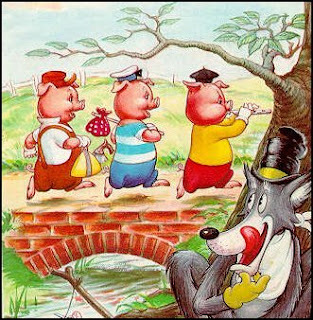 So the three little pigs set out into the world. The first little pig met a man carrying a bundle of straw and said, "Please may I have some of your straw to build a house with?" The man gave him some straw and the little pig built himself a fine straw house to live in. Soon, a hungry wolf came along. He knocked at the door and said, "Little pig, little pig, let me come in." "No, no, by the hair of my chinny chin chin. I won't let you in." "Then I'll huff and I'll puff and I'll blow your house in." So he huffed and he puffed and he blew the house in and ate up the first little pig. The second little pig met a man with a bundle of sticks. "Please may I have some of your sticks to build a house with?" The man gave him some sticks and the little pig built himself a fine stick house to live in. So he huffed and he puffed and he blew the house in and ate up the second little pig. The third little pig met a man with a bundle of bricks. "Please may I have some of your bricks to build a house with?" The man gave him some bricks and the little pig built himself a fine brick house to live in. "You may huff and you may puff, but you can not blow my house in," said the little pig. So he huffed and he puffed and he huffed and he puffed, but he could not blow the house in. Then the angry wolf said, "Little pig, you cannot hide. I will climb on the roof and come down the chimney." So the little pig made a big fire in the fireplace and he hung a pot of water over it. As soon as he heard the wolf coming down he snatched the lid off and the wolf fell right into the boiling water. And that little pig had a very good supper.